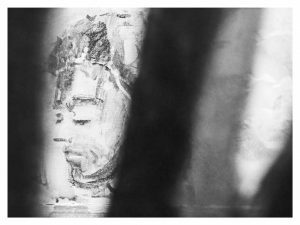 « Capital Punishment (Palmyra) », a double-sided painting, replicates a contrast that has provoked shock waves worldwide. 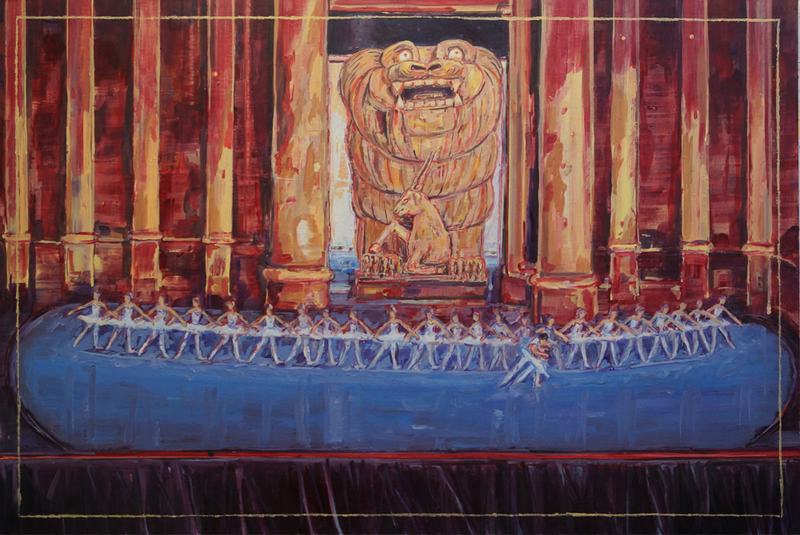 It evokes on the front side a classical ballet that took place at the Roman Theatre at Palmyra in 2011, with the ballerinas’ grace magnified by the ochre like colours and majesty of the ancient set, the scaenae frons, and by a replica of the Lion of Al-lāt, an 11 feet high limestone statue of a lion with a crouching gazelle between its front legs, which originally adorned the Temple of Al-Lat before Roman occupation in the second-century CE. 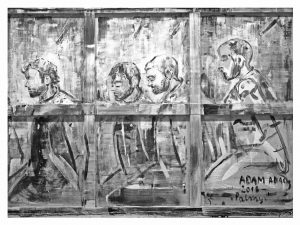 The back side of the canvas, with a black and white painting only visible thanks to photographs, evokes the executions of captives by the so-called “Islamic State” on the exact same stage four years after, in May 2015. Capital Punishment (Palmyra), 2018, oil and acrylic on back and front canvas, 130 x 195cm , and 4 fotos 30×40 cm. Capital Punishment (Palmyra), 2018, acrylic on back side of canvas, 130 x 195cm. 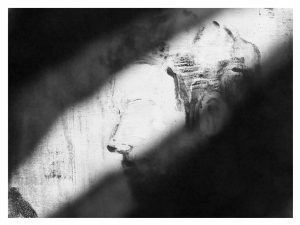 Capital Punishment (Palmyre),2018, photo, 30 x 40 cm. Capital Punishment (Palmyra), 2018, photo, 30 x 40 cm. 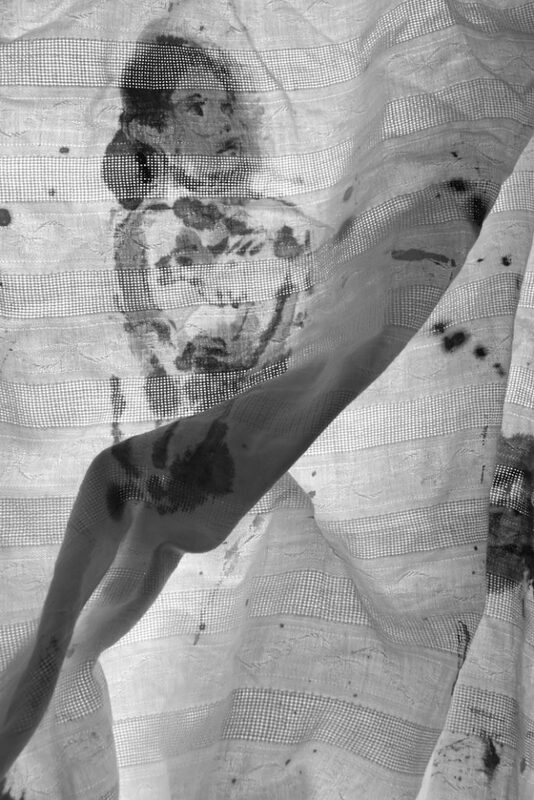 Syrian Sheet, 2018, photo of performative painting. 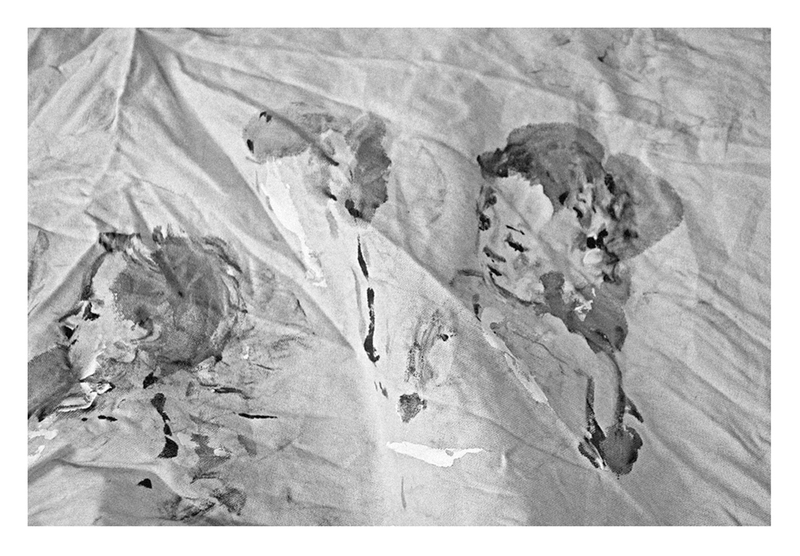 Le meilleur de moi, 2018, photo of performative drawing, 27 x 18cm.